"Woe, to what mortals’ country have I arrived?" Odysseus wonders, but you do not have to worry as you are in Santorini, the island of unique beauty and myth. 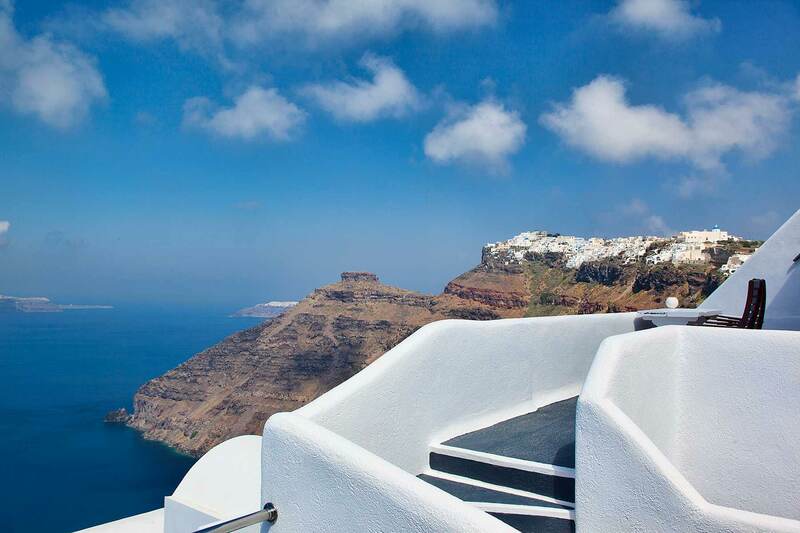 And here you will find all the information about Santorini and the village Firostefani. A visit to the archaeological site of Akrotiri and the museums of the island. Walks on villages at the caldera, Fira, Imerovigli and Oia, and also visit the hinterland villages of Pyrgos, Megalohori, Emporio. Swim on the beaches with the unusual, volcanic colours like red, black and white around the island. Book for a guided wine tour and enjoy wine tastings. 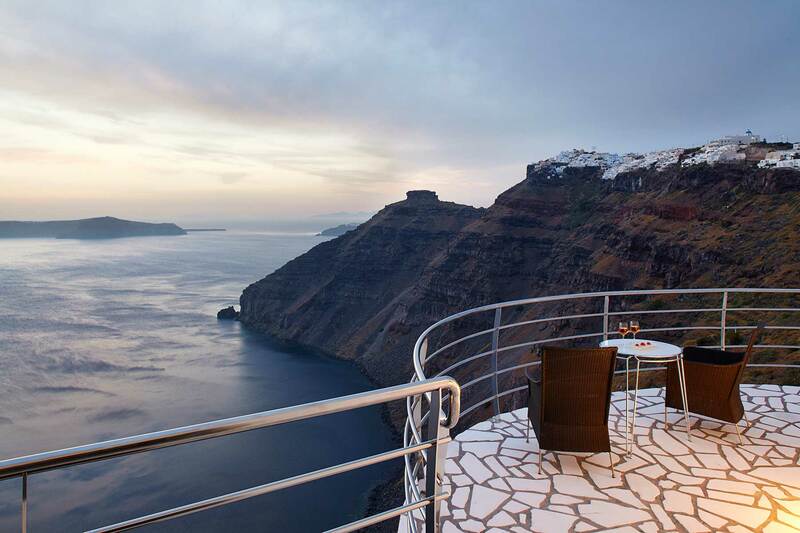 Arrange a cruise on the waters of the caldera to admire the scenery of Santorini and the caldera from the comfort of a deck. Tip: For all the details and necessary information, ask the staff of the Homeric Poems Hotel. It will be our pleasure to plan the best program for your enjoyment of the island of Santorini. Firostefani is one of the most beautiful villages of Santorini. It is the natural continuation on the north side of the capital of Fira, from which it is only a 10 minute walk. On the way you will always have views of the caldera. In Firostefani you will find a number of restaurants and cafes but, above all, enjoy the peacefulness of viewing the sea, the volcanoes, and the caldera from the comfort of your balcony. How to get here... 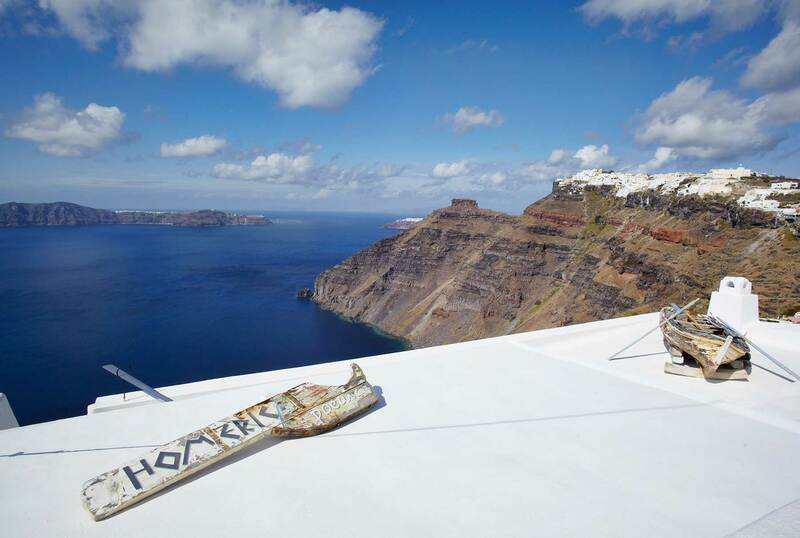 The Homeric Poems hotel is located in the village of Firostefani. 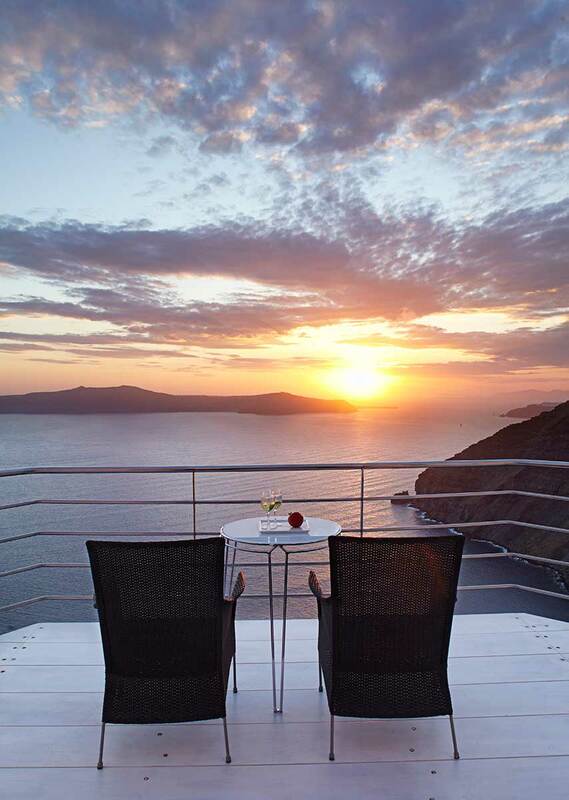 Just a 10 minutes walk from the town of Fira and 20 minutes by car from the airport and the port of Santorini. If you arrive with your car, look for the church of Agios Gerasimos and after parking in the nearby parking area take the road of the caldera (left of the church) and continue until you find the boat resting at the top of the Homeric Poems. Welcome.